If you are a registered Scuba Schedules partner, then when a diver wants to book, you will receive a Reservation Request like the one below. Simply contact the diver to complete the booking according to your own office system. RESERVATION REQUEST – FROM SCUBA SCHEDULES! Dear Scuba Schedules partner: A new booking inquiry has been received at Scuba Schedules. We’ve collected the participant information for you so that you can complete the booking according to your needs. Please see the diver details below and contact the diver as soon as possible. THIS IS NOT A CONFIRMED BOOKING. 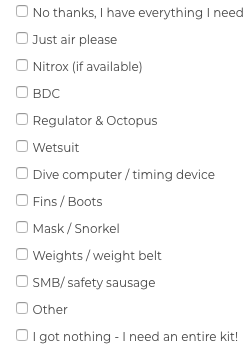 The diver(s) below are waiting to hear from you to answer any questions and complete the booking process, including the taking of any deposits / payments as necessary. ANY SPECIAL NEEDS? I’m turned 65 this year, just keep an eye on me!